The Indianapolis Mayor Bart Peterson visited the Sikh Temple on Acton Road on Sunday, October 7th for the second time in four years. The Mayor was accompanied by the City’s Faith-Based Coordinator, Ms. Marquisha Bridgeman. In a stunning surprise, the Mayor had brought a special Proclamation for one of our own, a beloved long-time tireless sevaks, Avtar Singh. The Proclamation read by the Mayor himself highlighted Avtar’s many services to the Hoosier Sikh Community and dedication to many worthy projects in and out side the Sikh American community over the last 37 years. The Honorable Mayor also participated in presenting a special and the First SEWA AWARD on behalf of the Sikh Satsang of Indianapolis to Avtar Singh for his distinguished service to the Sikh Satsang and growing Hoosier Sikh community. Avtar Singh, the humble and unassuming sevak and a community elder was deeply moved by this unexpected outpouring of love by the Sikh community and Satsang leadership. Avtar was especially touched by the extraordinary honor in the Mayor’s Proclamation declaring October 7, 2007 as Avtar Singh Day in Indianapolis. Mayor Bart Peterson was warmly received by the Sikh Satsang leaders and was enthusiastically introduced to a large audience of Sunday Worshippers by long-time Indiana resident and a friend of the Mayor, KP Singh, as a man who “stands tall because of his uncommon touch, humanitarian insights, unbounded enthusiasm and friendliness, and deep commitment to serve and make a difference.” KP further added, our Mayor is well aware of the commitment of Hoosier Sikhs to the City, and understands that “Sikh Americans have been innocent victims of ignorance, mistaken identity, harassment, and unprovoked violence” in many places across the USA since September 11, 2001. Mayor Bart Peterson in his remarks praised the Sikh community for their warm welcome, pioneer spirit and new creative investments as they set down their roots in central Indiana, and for their contributions and enthusiastic support of many civic and community events and organizations. The Mayor assured his personal support and friendship to the Sikh community as he presented his vision and efforts to make Indianapolis a welcome and attractive destination; a City that honors and celebrate diversity and City that is safe and serves all Indianapolis residents and visitors. Mayor Peterson challenged the gathering to get involved and be active partners in building a community that we may be all proud of and to serve within and outside our faith-based initiatives and commitments with the gifts that each of you bring to this City and your community. During his remarks, he cited several times the outstanding service of Avtar Singh to the Hoosier Sikh community and to the spirit of our City. Mayor Bart Peterson was presented with an inscribed copy of the elegant book, “The Illustrated History of the Sikhs” by Khushwant Singh, by Satsang President, Harpreet Sandhu and Satsang Trustee, Maninder Walia. Giani Pritam Singh, Head Priest of The Sikh Temple on Acton Road, presented The Honorable Mayor an Indian Shawl on behalf of the Sangat and during the Ardas (prayer and supplication) prayed for honored guest’s health and success in discharging his duties and awesome responsibility as our Mayor. 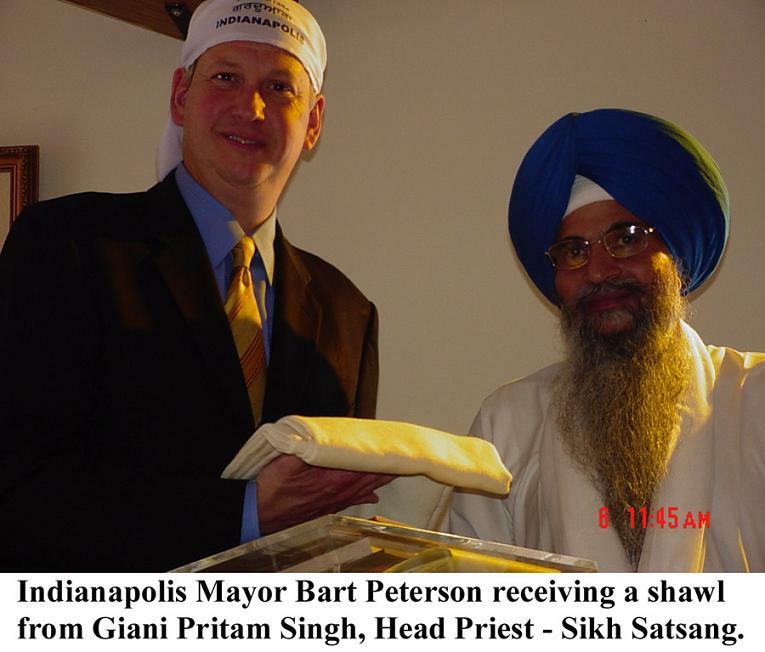 Mayor Bart Peterson’s visit was another example of the leadership of the Sikh Satsang pursuing the idea of expanding and accelerating its efforts and outreach towards the mainstreaming of the Hoosier Sikhs into the Indianapolis life, community, and institutions. To this end, several individual members and sometimes as a group, the Hoosier Sikh Americans have been actively supporting and participating in many educational forums, civic events and volunteer projects in central Indiana including, The Asian American Alliance’s annual multicultural, multi-ethnic and multi-generational “Race for All Races.” We have been participating in the September 11 “Community Fair on the Monument Circle” organized by The City of Indianapolis and United Way of Central Indiana that features hundreds of not-for profit groups and services. Each year, we have participated in The Indiana University Polis Center’s wonderful “Spirit & Place Festival,” the Carmelite Monastery’s moving “Interfaith Peace Prayer Service,” Saints Peter & Paul Cathedral’s beautiful “Interfaith Thanksgiving Service,” and many High School functions and other fundraising celebrations for worthy causes. P.S. : The attached photographs are contributed by Maninder Walia, KP Singh, Harpreet Sandhu.